WHY GRAFBOURSE ? Using day trading stock technical analysis, stock charts and stock market statistical analysis, well known of software using, professional day traders, but which the individual online stock trader cruelly lacks, Grafbourse, a free online stock market software, enables to track the main stocks of New York, (including many Chinese, Indian and Brazilian ADR's), as well as those of Paris, Germany, Milan and Madrid. We do not provide real time quotes, but technical stock trading strategies for stock market trading, very useful in times of great stock volatility. The stock market report, stock market charts and stock technical analysis are clear, legibly displayed. You will need a browser such as Internet Explorer 8+ (TM) or Firefox (TM). Furthermore, Grafbourse is iphone (TM) and other smartphones compatible. Free stock screening statistics for stock day trading is made on the main stocks every day, to construct a grid of technical stock market data indicators: quotes, historical prices, price target, volume, RSI,... Technical analysis focuses on stock chart interpretation related to moving average and relative strength index (RSI). Day trading help for the online stock day trader is so provided, enabling stock picking, using the grid of indicators. .............................. .............................. ¿ Por qué Grafbourse ?...........Warum Grafbourse ?...........Perchè Grafbourse ? The technical analysis provided by the majority of stock market softwares, technical analysis softwares and stock day trading sites are very (too much?) detailed. In addition, these trading softwares often presuppose the ability of the non professional online day trader to choose, in the various stock markets, the right security to study in depth. On the contrary, the LISTS of Grafbourse, online stock trading software, allow, at end of the day, to compare the performances (bigger rises, heavy falls, stronger volumes, high rsi..), of not just about fifteen securities, but several tens of securities for each index (NYSE, NASDAQ, CAC, DAX, IBEX, MIBTEL...) of the market. The stock traders will take their day trading decision all the more easily as the stock market data to judge stock performance and make a stock market forecast are more numerous: RSI, moving average, average volume, estimated potential...The whole presented in synoptic tables which do not overflow their screen. 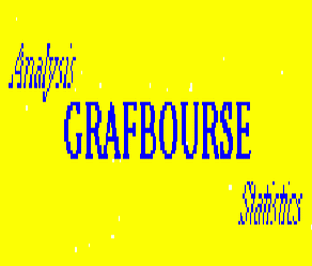 To choose the security of which he will make the technical analysis, the online stock trader will use Grafbourse as a stock statistical analysis software as well as a stock technical analysis software.